[UPDATE] – KUKA just published the well-advertised video of the table tennis match of top athlete Timo Boll and one of its fastest robots, the KUKA KR AGILUS. Don’t forget that even if the actual movements performed by the robot are real, the match is a directed and scripted advertisement with multiple takes (as you can see in the making of video below). It’s a very impressive presentation of the agility and speed of AGILUS, but it’s not an actual match. KUKA is celebrating with a very popular sport in China to mark the occasion of its new plant in Shanghai. Watch the video of the match below and read more about the making of. Mark your calendars for March 11th! 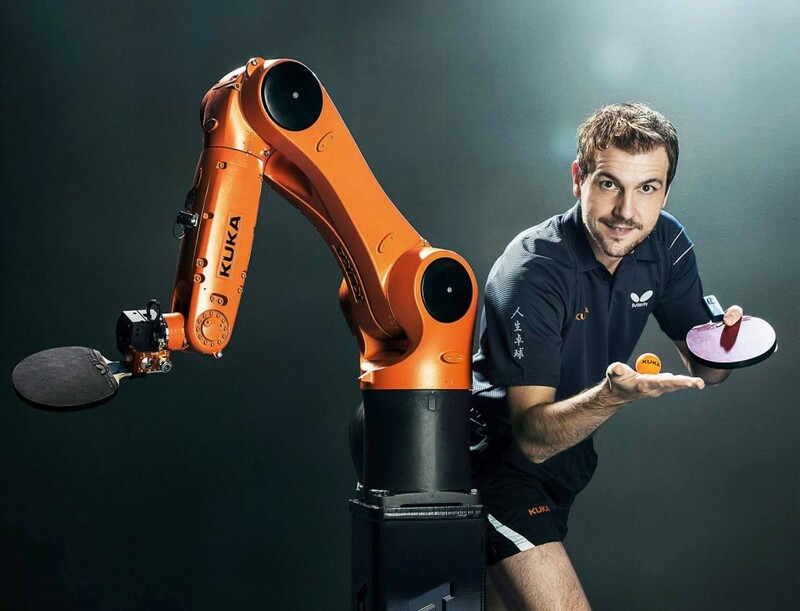 Timo Boll, Germany’s table tennis champion, currently ranked 8th in the world, will go up against a KUKA Agilus robot armed with special vision and software and a paddle. The promo video is pretty cool – it certainly makes you want to watch the match. Click here for viewing details. Hype aside, will the KUKA robot be able to beat a real ping pong champion? We can only watch. Thus far there’s been no details about the vision system and software used by KUKA. There are, however, stats for the Agilus robot – a single-armed 5 axes robot with a reach of 35.4″. Will this be another Jeopardy moment? Will the Agilus win? We’ll see on March 11th. Robots Playing Ping Pong: What’s Real, and What’s Not?